Introductory price 10 €. CD or DVD download. Always Current Lineox Enterprise Linux is a version of Lineox Enterprise Linux 3.0 which is constantly updated and contains only current versions of program packages. This means that there is no instant need to download and update the system after installation and the system is secure right from the start. Lets guess that you save half an hour. Now ask yourself: is that time more valuable than 15 €? The current version of Always Current Lineox™ Enterprise Linux is 3.146 and it contains 1330 updated packages totaling 1847.91 MB. Starting from version 3.011, Always Current Lineox Enterprise Linux can be installed to i586 class machines. Lineox Enterprise Linux 3.0 requires at least Pentium II class machine. Version 3.011 also contains update 2 (a largish batch of updates). Version 3.032 was the first version made also for 64-bit AMD processors. Version 3.037 contains update 3 and the installation environment was rebuilt, so it has better hardware support. Lineox has avoided respins because they mean that different versions behave differently and that can cause bigger negative effects than better hardware support. Always Current Lineox Enterprise Linux contains only the base distribution, not LIFF, and the extras directories found on the Lineox Enterprise Linux 3.0 DVD-ROM. Isn't Always Current Lineox Enterprise Linux untested or unreliable if it is released so often? Not really. We don't rebuild the installation environment, we just replace the installable packages with new ones. You can even use same boot floppies or other boot media created for Lineox Enterprise Linux 3.0 to boot Always Current series Lineox Enterprise Linux. So Always Current Lineox Enterprise Linux is as tested and reliable as a system installed from "base release" and updated later. The only difference really is the work and time saved and the higher security right from the start. See Lineox Enterprise Linux 3.0 product page for more information. 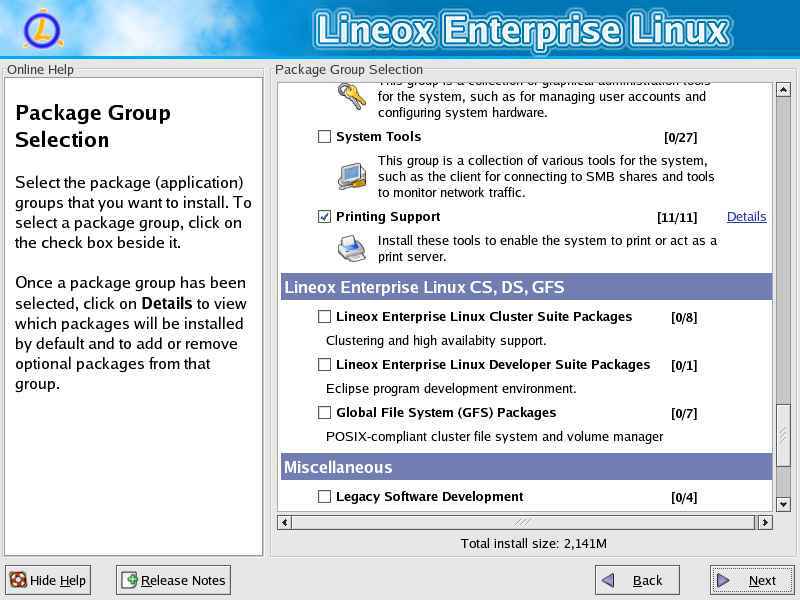 Cluster and Developer Suites can be selected during Always Current Lineox Enterprise Linux installation. Choose Custom installation type if you want to select package groups. GFS has been removed because the installation program installs additional wrong kernels if it is included. GFS can however installed later from Lineox updates repositories. "Linux" is a registered trademark of Linus Torvalds. All other trademarks are the property of their respective owners.